What a great way to bring joy, fun and excitement to your party! The PhotoBooth does all of that and more. We’ve taken the fun of a traditional vintage photo booth and merged it with new digital technology to bring you a one of a kind experience that adds fun and excitement to your party. Be it a wonderful wedding reception, a formal black tie event, reunion, or birthday, the PhotoBooth will make your event the most remembered, most exciting, and most fun! The PhotoBooth is completely automatic! Just sit down, press the button and you’re on your way to fun! It even talks you through each photo … amazing! A Live Preview feature, exclusive to the PhotoBooth, lets you see your photo just before it’s taken. Great for expressing yourself! Our special and exclusive dual screen allows everyone to see the fun - inside and out! The PhotoBooth can be set up in a number of ways to print classic double strips (one for you and one for your guest), 4X6 portraits, or anything you can imagine! Each photo is personalized to your event. We can add a logo to your photo, too - all at no extra charge! All photos are printed on high quality photo stock that will last a lifetime. It’s fast, too - less than 20 seconds to print your photo! The PhotoBooth does it’s work all night long in a space smaller than a banquet table. But don’t let its size fool you. 2-8 folks can get their photo taken. With our special PhotoLounge attachment, up to 20 can smile for the camera! Along with all the great memories the PhotoBooth prints out all night long, you’ll get a CD of each and every image to look at again - online too, if you like. In addition, we’ll provide an elegant scrapbook for guest pictures and their personal messages to you, right next to their picture. What a great memory! 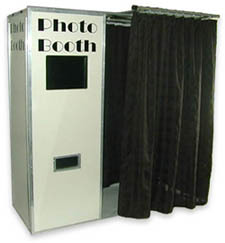 We include our famous prop and party favor kit with each PhotoBooth. Have some fun with a fancy mask, hat, umbrella, boa, and more! You’re an instant movie star with the PhotoBooth. Our guarantee for GREAT FUN!